Toxic fumes are directly related to the design of modern aircraft. Commercial aircraft are pressurized in order for crew and passengers to breathe at altitudes above 8,000 feet. Aircraft engines and auxiliary power units are the source of pressurized air inside the cabin. Air entering the engine is quickly compressed into a smaller chamber, including a small portion known as the “bleed air”. This air bleed is used to pressurize the cabin. Synthetic lubricants are used to keep moving parts in a jet engine at a cool operating temperature. If there is a malfunction, the lubricating oil or other chemicals such as de-icing fluid can be pulled into the bleed air and fed directly into the aircraft cabin. At high temperatures, the additives in these products can degrade and become aerosolized. There is no filtration equipment currently onboard commercial aircraft designed to remove these superheated and toxic fumes. The resulting cabin odour is often referred to as a ‘dirty sock’ smell as chemicals are drawn into the bleed air and then deposited into the cabin. However, due to the design of cabin air systems, this odour may only be noticeable in the front and rear. Other indications are smoke in the cabin, and the quick onset of otherwise unexplainable symptoms (see section below). Even the best maintained engines under the strictest of maintenance schedules can malfunction or breakdown. In some cases, the cause may simply be overfilling of oil reservoirs. The only way to totally ensure that flight attendants and passengers are not being exposed to contaminated bleed air is to fit aircraft with filtration systems that eliminate any potential air contamination, or to actually change the way pressurized air is brought into the cabin when aircraft are designed. The Boeing 787, for example, uses electric compressors rather than bleed air to supply air to the cabin. Unfortunately, too few new aircraft are being designed with safer systems, with manufacturers continuing to use the riskier, but less costly, bleed air technology. Why is this an issue for flight attendants and passengers? There is significant evidence showing exposure to chemicals through the bleed air is a hazard and can lead to the following symptoms while on board: irritation of eyes, nose and upper airways, cough, breathing difficulties, tightness in chest, blurred or tunnel vision, headache or light headedness, dizziness, difficulty concentrating, nausea, and vomiting. Longer term effects include damage to the respiratory and central nervous system, impaired memory and cognitive function, weakened immunity, cardiovascular disorders and possibly cancers. Though flight attendants and pilots are most affected due to higher levels of exposure, passengers are also at risk. It is estimated that millions of crew and passengers have been exposed since bleed air was first introduced in 1963. Some passengers who are genetically susceptible to toxins may fall ill. Passengers do not have access to emergency oxygen when there are fumes in the cabin. Finally, it has been speculated that cognitive impairment of flight crew due to toxic fumes can be linked to crashes. For these and other reasons, passengers also require protection. Despite this scientific evidence many airlines continue to publicly deny that toxic fumes pose a serious threat to crew and passengers. However, many flight attendant unions including The Canadian Union of Public Employees (CUPE), continue to urgently raise the issues with airline operators and regulators. Some US airlines and airplane manufacturers have begun developing options to add filtration technology to existing systems, or convert them to bleedless technology. One French oil manufacturer also produces products free of the toxic additives most prone to creating toxic fumes onboard. Many unions, including CUPE, have contributed toward the cost of research at the University of Washington that will produce a scientifically reliable blood test to measure exposure, as well as clearer data on the side effects to humans related to neurotoxic additives in engine oils and hydraulic fluids. This research would progress faster with greater government and industry support. Other measures to minimize risk can be taken. These include greater oversight by regulators; fitting contaminated air detection systems; crew education to ensure 100 per cent emergency oxygen is always used; heightened enforcement and education on the use of the Canada Labour Code reporting system; the use of oil and hydraulic fluids free of neurotoxic additives; and full scale epidemiological surveys of crew, including screening for blood biomarkers when such tests become available. 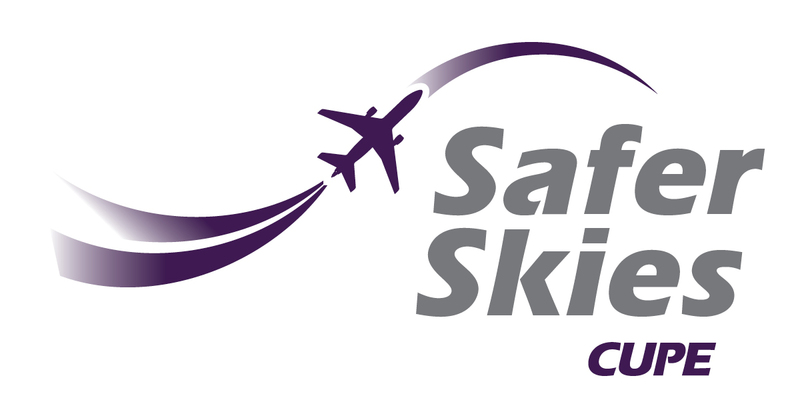 CUPE maintains that airline operators and Transport Canada must take much more concerted action in eliminating toxic fumes in order to protect the health of passengers and crew. During the last federal campaign, CUPE’s Airline Division sent a report card to all major parties asking them, among other things, if they supported measures to ensure air quality on board is monitored, and a healthy air supply is maintained. CUPE calls on the federal government to act immediately to bring together representatives from the airline industry, the medical and scientific communities, and airline unions, including CUPE, to identify and recommend all possible regulatory options to eliminate the harmful effects of toxic fumes. We further ask that any stakeholder consultation be conducted face to face, in a fully transparent and inclusive manner, with results available to Parliament and the public. CUPE is Canada’s largest union with 639,000 members. We are the union for flight attendants with over 10,000 members working for Air Canada mainline and rouge, Air Transat, Calm Air, Canadian North, Cathay Pacific, First Air, and Sunwing Airlines.